On September 23, 1963, Archbishop John A. Floersh announced plans for the establishment of a new parish in southeastern Jefferson County. This new Parish would be called St. Bernard, named for the patron Saint of its first Pastor, Father Joseph Bernard Glick. Amidst a community of some two hundred families, ground was broken on March 15, 1964, and the corner stone set on July 5th. Daily Mass was held in the rectory basement; Sunday Mass was held at St. Gabriel until the church was finished. On October 18, 1964, the first parish Mass was held in the new church. A year and a half later the convent was completed. In 1969 the annex to the school was added to meet the demands for more classroom space in the rapidly growing community. The Ursuline Sisters of Mount St. Joseph, Maple Mount, Kentucky along with a staff of lay teachers and staff have provided a quality Catholic education for students of St. Bernard. In response to the Second Vatican Council, renovation to the Church was done in the spring of 1975. In 1978 the Parish Hall was built. 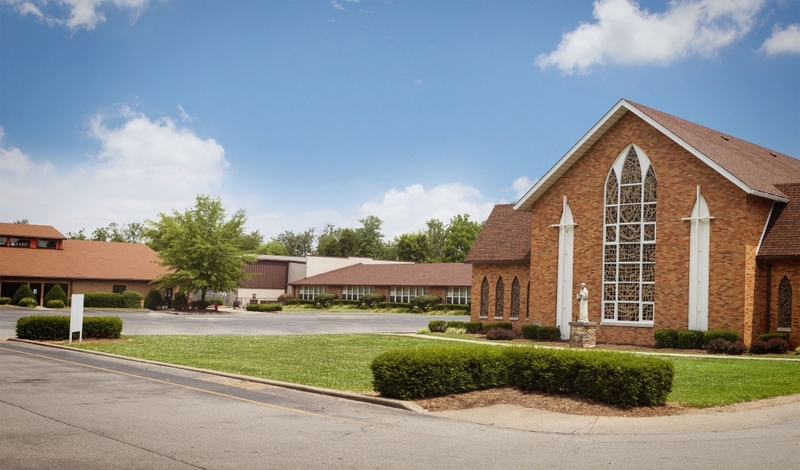 In 1990, St. Bernard began housing the Fern Creek/Highview United Ministries Adult Day Care Center. In 1992, the Church was renovated again. In early 1996 we initiated our “Build for Tomorrow” campaign to raise funds to add a new building to our campus to accommodate more classrooms, meeting space and a commons area for our growing needs. Our Education and Formation Center was finished in August 1997. In the spring of 2008, Fern Creek/Highview United Ministries moved into thier new facilities on beulah Church Road. The area previously used for their Adult Day Care Center was renovated to make room for our preschool classes, as well as our after-school care program. Our Parish Annex was used for additional offices, meeting rooms, and youth space. Today, St. Bernard’s community is made up of over 800 families. Because of the variety of our parishioners, St. Bernard strives to meet the needs of all our parish family through worship, outreach, special ministries, and social gatherings. In September 2013 we began a year of celebrating our 50th Anniversary as a Parish and ended on October 18, 2014 celebrating the 50th Anniversary of St. Bernard School and the first Mass celebrated in our Church.